Just the time to get a shower, pack (again) and we jumped on a taxi directed to the area of Zicatela looking for a new accommodation. That morning I met Giorgio for breakfast, he helped me to take a look around and find a place to stay while Soo as usual was looking after the backpacks sipping a nice coffee at Cafecito. We have different roles in this trip and this is actually one of my duties. We are a good, equilibrated team. 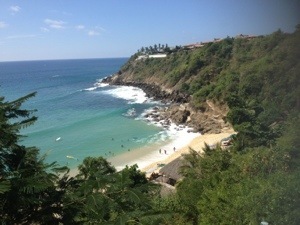 Apparently in November Puerto Escondido is quite full of events and it gets very busy, with few available accommodations. That week was time for surfers and fishing championships, two of the many tourist attractions. We saw few options, some were really crumbling but we finally found a nice available cabana for me and Soo at “Rockaway Hotel” just in front of the beach. We didn’t want more than that: a cozy, clean dark wooden cabana with barely any cement, all around a swimming pool and a little bar with thatched roof. Puerto Escondido in English means “hidden port”, the legend says that a young woman escaped her pirates’ captors and hid there. She jumped overboard the ship to get to shore and hide in the jungle just beyond the beach. Since then, the pirates referred to the woman as “La Escondida” (the hidden one) and every time the ship returned to these waters, the captain ordered his crew to search and area around the bay, however, they never found her. Hence, the area became known as the Bahia de la Escondida. Tourism in Puerto began to flourish in the 1960s when mostly surfers from different parts of the lobe began to appreciate the beautiful Oaxaca coast; and I know why: this place has an average annual temperature of 28°C, nice beaches, bars and hotels, as well as a big variety of cafes, restaurants, nightclubs, craft shops, Internet cafes and scuba diving rental spread out through the long promenade. Nevertheless, Puerto Escondido tourism is not as much exploited as Acapulco for example, due to the fact that bus rides from the Oaxaca capital take seven hours over windy turns as the roads descend the Sierra del Sur mountain range. I did it during the night and it was not the best experience ever. Furthermore, there is no direct flight from abroad but only domestic flights. 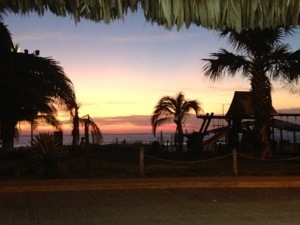 Sunset in Puerto is always breathtaking from wherever along the promenade. I had promised Giorgio I would go and watch him surfing in the afternoon and afterwards we would enjoy the sunset together. And so it was, me and Soo went to the beach and relaxed until he would come out of the water and greet us with his usual charming and big smile. Soo and I agreed that with those blond curly hair and blue eyes he just looked like a little angel! The three of us laid on the sand for a while taking a look at the people staring at the sunset taking romantic or funny pictures, while we were talking about our next travel plans, our life when not travelling , especially Giorgio’s exciting job on yachts in every part of the globe’s waters, our common love for Ibiza etc. I was having a nice time but I also felt the need to go and write for my blog at Casa Babylon. I ordered the usual ginger tea and spent few hours on my own very focused on my stories to tell. I was surrounded by books, Mexican masks and inebriated by fresh tea smell. I couldn’t desire more, I was enjoying my solitude a lot, and I was so lost in my thoughts when l I felt my arms shaken and turning on the right I saw that tall and tanned young boy of that previous night who had came there at the Babylon to say hi. I shifted from sipping a lovely tea to taste a Corona. we had a few ones, talking about many things, especially our common love for Stockholm and Swedish culture in general. He had been there six months for study, and I have been there few times and consider it as one of my favorite cities in Europe. I am glad that Soo knew were exactly to find me in case we got lost: while getting my cheeks red on few of Tarik s wisecracks I saw my lovely travel mate with her usual glasses and funny smile entering from the main Casa Babylon door. After few minutes also Tarik’s friend Victor joined us and we kept drinking few beers and before going to a reggae party on the beach we stopped at the usual taco place few blocks away. The party was just on the beach, a big bar with thatched hut, very exotic, I really liked the venue but that music after 20 minutes bored me, plus the barman were so slow… it took 20 minutes to prepare my favorite drink: mojito de tequila. 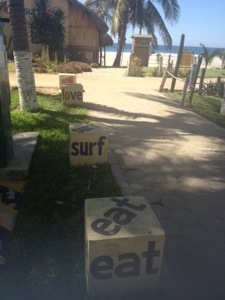 Fructas y verduras is not just a sort of food in Puerto Escondido. The beach there is very appealing for surf lovers. I got a ride back to the hostel. 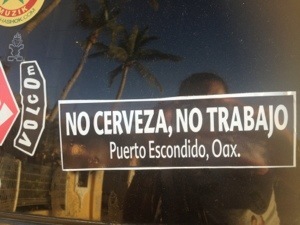 Ya tienes casa en el D.F. or “ya nos veremos en London” were the last words before to slam the door. You never know whenever those are circumstantial sentences or if you will ever see that person again in life. I am normally quite good in keeping in touch with people; last year I met again a Turkish couple I had met with Giuliano in Capri ten years before, and two years ago I went to visit to Stockholm one of the girls I use to hang out with in Barcelona when I studied there in 2003. I like to take a little bit of every single person I meet, and each of them in this trip or in life in general has brought something awesome to me. The sun was burning, that morning I found Soo at the usual Cafecito having breakfast so we went straight to a beautiful small beach called Carrizalillo: white sand and cobalt blue, calm waters on a small bay; There are no vehicular roads to this beach, and the footpath descends a steep slope; you might find it not too good to walk up the stairs on the way back, but the positive thing is that the difficult access reduces the numerous / annoying beach vendors you might find in other beaches. While relaxing in carrizalillo with your eyes shut and trying to get a nap you will be often surprised by sporty locals who want to convince you to try to surf: even though I find it a super cool sport I don’t feel minimally attracted to try it. So far I enjoyed just swimming and lying on the sand letting the sun kiss me while I listen to my favorite music. On the way back we stopped at Playa Marinero and enjoyed a nice sunset while walking to the hostel. We chilled out at the cabana until Giorgio and David came to pick us up there and went to a lovely Italian restaurant called Bananas, where the chef is a nice and funny guy from Sardinia. 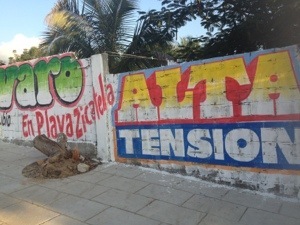 Apparently there is an increasing immigration from my citizens to Puerto Escondido as well. I don’t normally like to order Italian food abroad, but his vegetarian lasagna was awesome, as well as the salad he prepared just for me with a homemade tasty and juicy burger. We went to Oxxo for cigarettes and I found out they still sell Cremino , one of my favorite chocolates when I was a baby; I think I have not seen them at least for the past 15 years and it was nice to try again that childhood flavor so far away from the place I grow up. 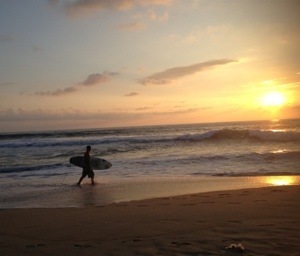 Soo and I decided to spend our (supposed) last night in Puerto Escondido by going early to bed and relax. I wrote quite a lot as well. We woke up well rested, packed our things and left our backpacks at the reception while we would go for a (last) swim. 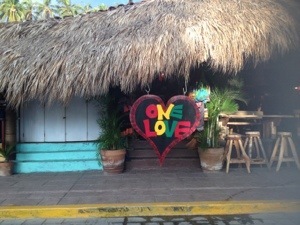 I lied nearly all day on a white sun bed at Kabbalah bar while enjoying nice chill music, fresh fruit and juices. Afterwards I decided to go and try Fish tacos, one of the most popular and fancy taquerias in the area, I ordered a chicken and avocado one and I found it amazing. When I went to collect my backpack at the reception I bumped in a funny Australian guy who was just arriving instead; maybe I was not really happy to leave this place, but afterwards I discovered that he would have not let me do it. It was not difficult for him to persuade Soo as well to stay, and so it was, again changing our plans last minute. We went to our agency to change our bus tickets. 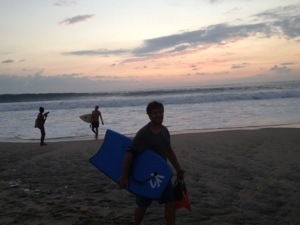 Andrew is a surf fanatic from Sidney, travelling Mexico with his Hawaiian friend Maika and an occasional travel mate from Ireland met on the road. We had few drinks at the hotel and spent a lovely night with Bag Raiders as a soundtrack. I didn’t know that band was actually Australian until then. 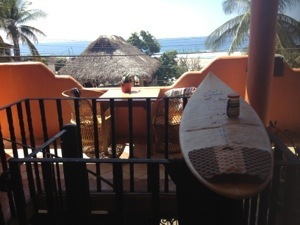 It took me at least a minute to me and 4 times to him to feel glad I had not been persuaded by staying one more night in Puerto Escondido for a guy who would tell loud and enthusiastic to a stranger about his love for cooking delicious meals instead of drugs. 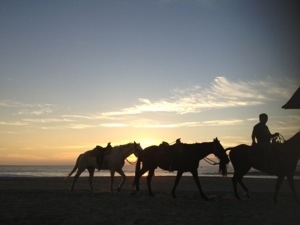 We would spend the following day all together and enjoying the last sunset on the beach, where the only view interruptions where from other surfers with their table ending their sporty day and from few horses galloping in the shore. That night I farewell my lovely travels mate Soo after about two weeks heading to San Cristobal while she would go back to Oaxaca capital.